When Christina was two years old she suffered complications from a blood infection caused by chicken pox and her leg was amputated below the knee. Her father, Michael Waites, told us she has never let the situation stop her from pursuing her dreams. “Christina has a competitive spirit and constantly pushes beyond her physical disability” he said, as he smiled with pride when talking about his daughter. Christina decided to try out for the high school swim team, after watching and noticing how much her older brother and hero, Andrew Lang, was enjoying swimming. She made the high school swim team and soon found that she not only had a natural aptitude for the sport, but also found it very exciting! She soon found herself wanting to pursue larger competitions. "I don’t see myself as any different," said Lang. "So I don’t like it when people see me as different." Christina started to seek out and participate in larger and external, reputable teams, such as the Palm Harbor YMCA Piranhas. Here coaches provided insight on what she needed to accomplish to become a professional, competitive swimmer. As Christina’s interest grew, her mom Shannon Waites, conducted research to find larger swim competitions across the country and Christina began to travel to these events. “We were busying trying to keep up as she was pretty driven and we continued to encourage and help her focus on achieving her goal.” said Michael. “Christina continually finds ways to discover opportunities that we never realized existed. We try to keep her grounded, but stand by her and encourage her to reach for her full potential.” said her mom, Shannon Waites. The events Christina participated in were the same events the Paralympics recruiting committee came to see to follow competitors in action. She was immediately spotted by the committee at Christina’s first International swim competition in Quebec, Canada and was invited to attend the 2016 Paralympic Trials for Rio. “Her coach couldn’t go with her to this meet and Christina was really nervous about being there with no direction. The Paralympic team coaches spotted her and by the end of the first day, they were working with her as if she were already on the team. It was really exciting and gave her a huge boost of confidence.” says mom, Shannon Waites. After the Trials Christina took a short break to focus on college and in early 2018 she decided to jump back into training. She quickly regained what she had lost during her break, and she decided to reach out to the Paralympic team. 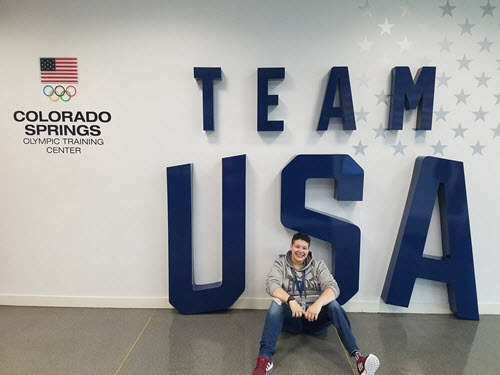 They were happy to hear she was back into training and invited her to train at the Team USA Paralympics training facility in Colorado Springs. She has been there a little over two months. In order to stay and continue to progress she has particular milestones that she has to meet, such as progressing qualifying times. “I am working hard at this amazing facility. It is intense, but is exactly what I need to help me get to the next level. My motto has always been, what the mind believes the body will achieve. I think we are all capable of much more than we think sometimes.” said Christina. Clarifire wishes Christina, Michael and the entire family good luck in the pursuit of her dream. We will be rooting for her! Follow her progress on our Facebook Page and Twitter.